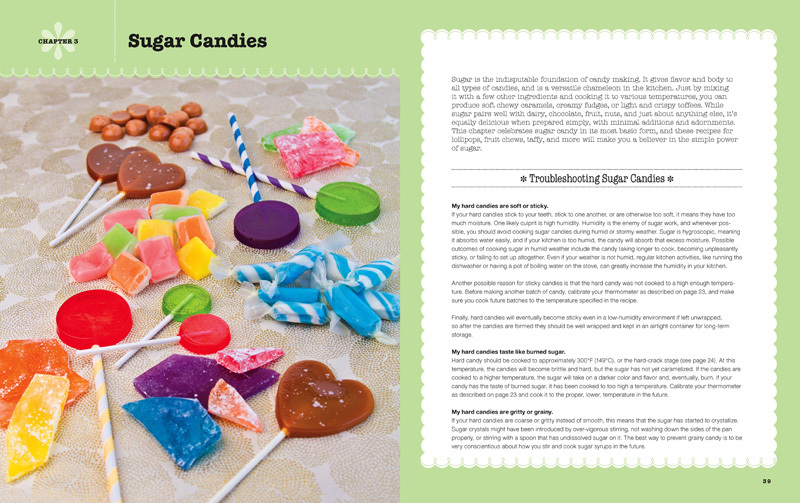 My first cookbook, The Sweet Book of Candy Making, was made with love, care, and a whoooole lot of sugar. The recipes were developed and tested in my very own kitchen, and from the beginning they were designed with the home candy-maker in mind. I want you to feel like there’s a friend with you in the kitchen, guiding you through any tricky steps. Love pictures? It’s got a ton of ’em, all in full color! Crave a little food science knowledge? I’ve got you covered. Want help troubleshooting some problems you’re having? There’s a troubleshooting section in each and every chapter. Every single recipe has a beautiful full-color photo, and many include sidebars, tips, and variations to help you get creative in the kitchen! I'M READY - LET'S MAKE CANDY! Have been wanting to try making various types of candies with minimal investment pending results outcome. This book provides everything you need to know about supplies, ingredients, recipes, etc. Information is presented in clear, concise easy to understand manner. Photos are plentiful. Any questions can be easily referenced in the book. The recipes offer something for every level of expertise. Highly recommend to everyone interested in making candy. THIS is THE candy making book you need! LOVE this candy making book! The author is so talented. I’ve been following her food blog for years and this book makes me want to taste everything in it. The recipes I’ve made with my boys are great! They especially loved the salt water taffy. This is a lovely and inspirational cookbook. The instructions are friendly and comprehensive and pay particular attention to some of the trickier aspects of candy making such as tempering chocolate, making caramel, and more. It is also very pretty and inspirational – I want to make everything in the book! This is a fantastic book for the beginner who has never made candy. Includes fudge, caramels, and toffees. The books is well-written when sometimes cookbooks might have great recipes but awful copy. It also includes troubleshooting for the typical problems when making the recipes in the book. Wow, Must Have for the At-Home Candy Maker! This a super book! It is everything I ever wanted in a candy making book. This is my first book on candy-making and it is very comprehensive book in terms of recipes, techniques and trouble shooting. There are photos of every step in the process and the kindle-edition is perfect in terms of the placement of the step-by-step images and the written explanation for each recipe. In this book, you learn everything from fudge to truffles, marshmallows to taffy, and even pulled sugar and sugar curls. Whatever mess-up you’ve had in the past, there is an answer for it in this book. Once you read this, you’ll be able to fix and kitchen oopsy with your sweet confections. Although this is a cook book and a technique book as well, it is also a great read. 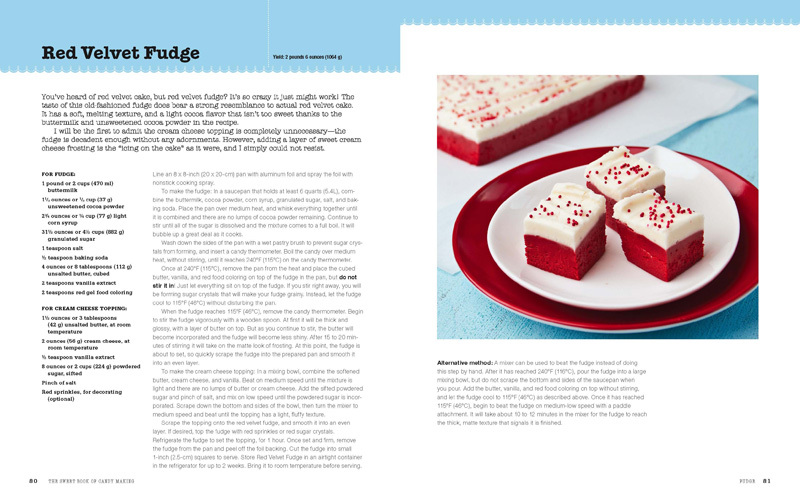 There are brief narratives woven throughout the book, and the author’s bright personality and passion for candy really shine through and add beautiful color to a true gem of a book for any candy maker. I was so excited and filled with child-like joy reading such wonderful, nostalgic recipes that I finished the book in one sitting. If you are at all interested in candy making, don’t think twice on this one. Go for it! I love this book! I learned a lot from it. The first chapter is especially helpful for a beginner like me. 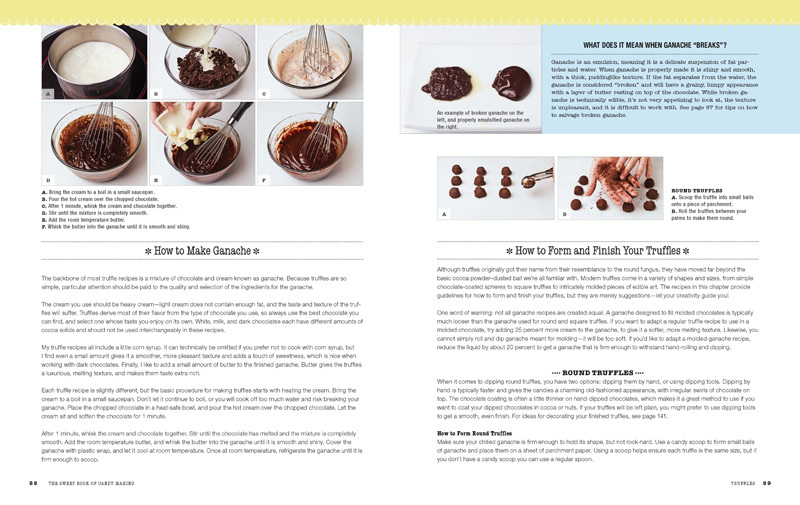 The author covers technique, equipment, and ingredients in detail so that I know what I need and what to expect when making a candy. The recipes are tasty and there is a nice range from fun to unique. I even bought a copy to give as a gift. I won’t go into all the “this book contains thus and so…” stuff other than to say I have a TON of candy books and this is probably my favorite. It’s a technique book primarily which focuses on nine kinds of confections and helps out with both troubleshooting and presentation (two things other candy books seem to not focus on). The pictures are very helpful (and colorful!) and the text is easy to understand. I’ve been baking for over 40 years now and candy making can challenge even the most experienced confectioner. With this book I’ve gleaned great ideas and learned to troubleshoot a few challenging techniques. 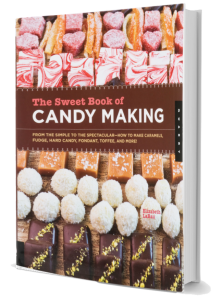 If you only buy one candy-making book, I highly recommend this one.